Reference number for this case: 8-Oct-54-Indre. Thank you for including this reference number in any correspondence with me regarding this case. US Air Force Project Blue Book was in charge of studying UFO sighting reports, and thus collected media information about it. The text below is their translation into English of an Agence France Presse (AFP) news release for October 9, 1954. Paris, Oct. 9 (AFP) -- On Friday, several mysterious craft were once more seen in the sky of France. 1. Near Mans, a milk collector declared that his truck stopped for an unknown reason and that, when he got out, he saw a luminous red and blue flying cigar, about a meter long, pass over him. When the machine had disappeared, the truck motor began again to operate. 2. At Cherbourg, several people saw a "luminous sphere" at a rather high altitude. After hovering over the town, this disappeared toward the south. 3. In Finistere, many people were alarmed by a luminous sphere maneuvering only about a dozen meters from the ground, which seemed to move toward them. 4. A resident of the Indre observed a gray-colored object motionless at about 100 meters of altitude. That craft then departed at a very brisk pace, leaving a sort of fog behind it. Another resident of this department declared that he saw a luminous pale red-orange object moving along a north-south axis. 5. 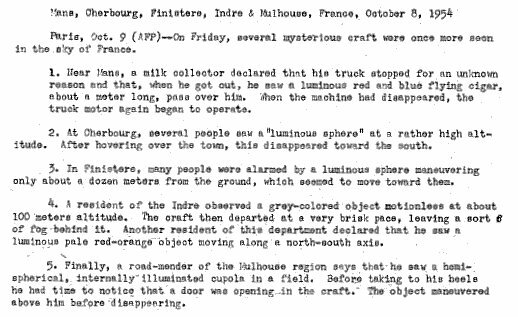 Finally, a road-mender of the Mulhouse region says that he saw a hemi-spherical, internally illuminated cupola in a field. Before taking to his heels he had time to notice that a door was opening on the craft. The object maneuvered above him before disappearing. [af1] Agence France Presse (AFP) newsbrief transcription and translation, in the Project Blue Book archive, US Air Force archive at the National Archive and Record Administration (NARA), Washington DC, USA.